Correcting for mistakes you made during the shoot, such as over- or underexposure or incorrect white balance. Matching shots taken at different times and/or locations so that they look as if they were captured at the same time and place. Creating a particular look or style to support a mood, such as making a scene appear bright, warm, and cheery, or dark, cold, and foreboding. Regardless of your goal, Final Cut Pro X includes powerful tools for grading your video. Let's get familiar with them as we explore the basics of color correction. The primary tool for correcting video in Final Cut Pro X is called the Color Board. With the playhead over a clip in your project that you want to correct, open the Inspector (press Command-4 or click the Inspector button in the toolbar) and select the Video pane if necessary. The Color section contains three tools for adjusting the color of a clip. The first, Balance, attempts to fix the brightness and color values of a clip automatically. To try it, just click the box to the left to enable it. The next tool, Match Color, is great for matching one shot to another. All you need to do is click the Choose button and then click a clip you want to match to. Both of these tools are simple and useful, but they are also one-trick ponies--either they work or they don't. The third tool, Correction, is what we are interested in, as it gives us the most creative control. It's enabled by default (as the blue box indicates), but it has no impact on the image until we adjust it. To do so, click the right-facing Show Correction arrow to reveal the Color Board. Before you get to work in the Color Board, it can be helpful to have the Video Scopes open. Click the tiny light-switch icon at the top right of the Viewer and choose Show Video Scopes, choose Window > Viewer Display > Show Video Scopes, or press Command-7. As you can see, Final Cut Pro X often gives you several ways to accomplish tasks. The Video Scopes window appears next to the Viewer. The Scopes provide brightness and color information about the current frame of video, and you have many options for configuring them. Click the Settings menu at the top right of the window, and select the Waveform. Then click it again and select the Vertical Layout option, which places the Waveform beneath the image in the Viewer. You are now all set to start correcting the image. To really understand color correction, you need some knowledge of color theory, which is beyond the scope of this article. However, the basic idea is that a good starting point is to work on the overall brightness or luminance of a shot first, and then adjust its color components, which consist of hue and saturation. 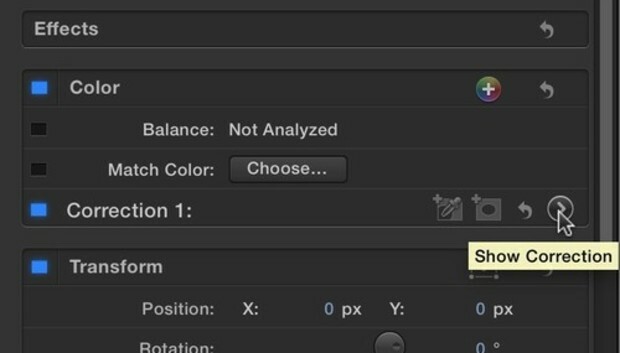 In Final Cut Pro X, you adjust brightness values in the Exposure pane of the Color Board. The Waveform is the scope that tells you how bright and dark the pixels are as you move across the image from left to right, with 0 being darkest and 100 being brightest. As you can see by examining the Waveform and by looking at the image itself, our example shot doesn't have many dark areas. The Color Board has a master slider on the left that lets you adjust the overall (global) exposure, and it also has three controls for adjusting the shadows (black circle), midtones (grey circle) and highlights (white circle) independently. Simply drag the controls up and down, using the Waveform as a guide, to create more contrast for the shot. Once you are happy with the exposure, a good next step is to evaluate the saturation, which refers to how rich the colors are. Select the Saturation pane in the Color Board. In the Video Scopes window, use the Settings menu to select the Vectorscope, which displays saturation information as dots for each image pixel inside a circular graph. The farther out from the center, the more saturated the pixels are. Although you can adjust saturation in the shadows, midtones, and highlights separately, I often find that the global slider is all that I need to use. In the example here, I've bumped up the saturation to make the grapes and leaves more colorful, being careful to keep the bright dots in the Vectorscope from touching the boxes around the perimeter. By the way, to make an image black and white, simply drag the global slider all the way down to remove all saturation, and therefore all color, from the image. The last step is to adjust the hues in the clip. The hues are the actual color values, as in red or yellow or blue. You adjust the hues in the Color pane of the Color Board. Select this pane, and you'll see that it contains four controls over a rainbow of colors. The large control on the left is the global control and the other three once again allow you to manipulate the shadows, midtones, and highlights individually. Now, use the Settings menu to select the Histogram, and set it to the RGB Parade. This scope displays the red, green, and blue components of the image separately so that you can see how much of each is contained in the shadows, midtones, and highlights as you move across the graph. The example image is pretty evenly balanced, but in this case let's see if we can make a more dramatic shot. The idea here is to adjust the hue of the shot by dragging the controls up into the color you want to add. Dragging the midtones control up into the reds will warm up the green leaves, creating a feeling of a warm October afternoon. Dragging the shadows control up into the blues will give dark areas of the grapes a rich, vibrant shade. With this initial pass completed, it's important to check the correction against the original image. Our eyes adjust quickly to changes in contrast and color, and it's easy to overcorrect a shot. Click the left-facing arrow at the top left of the Color Board to return to the Video Inspector, and click the blue box to toggle the correction on and off. If you are happy with the result, you can now save this correction as a preset (by returning to the Color Board, clicking the Preset button at the bottom, and giving it a name), or you can simply copy the correction from this clip and use Edit > Paste Attributes to apply it to other clips in your project. There's a lot more to color correction, such as applying multiple corrections to a clip, using masks and color ranges to color parts of a clip selectively (a process known as secondary color correction), and using another Viewer window to assist in matching shots to each other. Final Cut Pro X has all the tools to accomplish these tasks and others. I encourage you to experiment with the Color Board and discover how you can start to color-correct your own shots.